Hello! I’m J.A. Poolvos from Little Bear Crochets and I’ve prepared a free pattern for you. It’s a perfect project to busy yourself with during the upcoming Easter weekend! 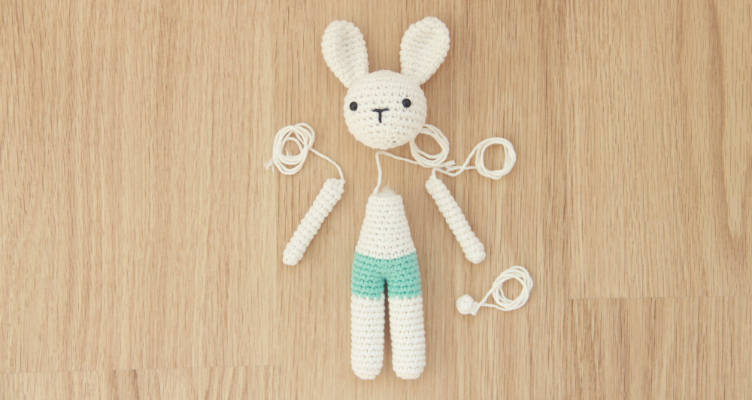 Using the recommended yarn and hook, this bunny will turn out to be 20 cm (7.8 inches) tall. However, you can use any other type of yarn and matching hook size to make him bigger or smaller. 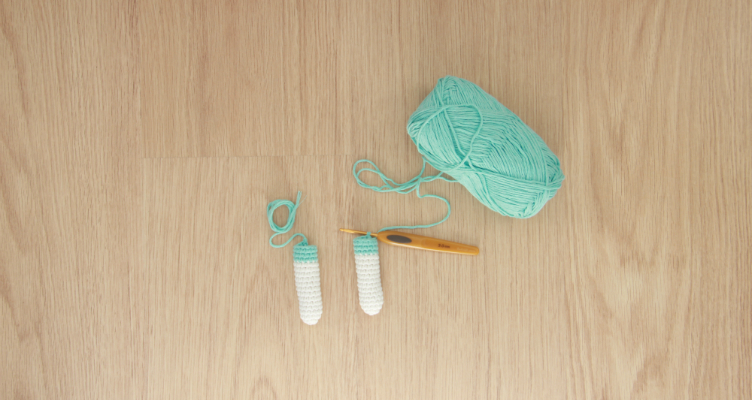 You will be crocheting in continuous rounds, which is the regular way to crochet amigurumi toys. 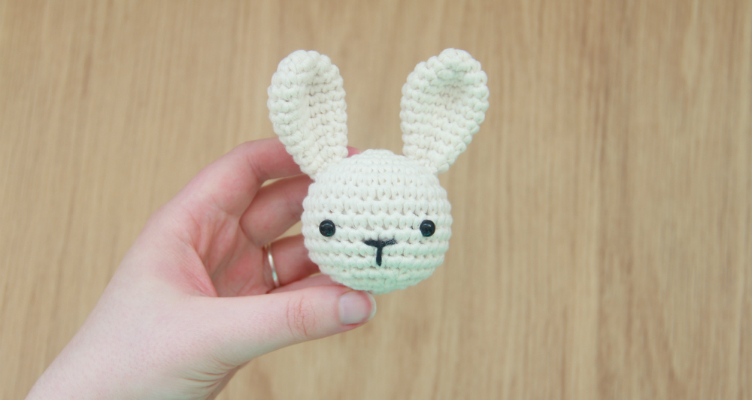 If you’re not familiar with amigurumi, check out my previous blog post on how to start with amigurumi. Put the eyes between row X and X with X stitches between them. Start stuffing and keep stuffing while you crochet along. Fo and work away your thread. Fo and keep a long thread for sewing. Don’t stuff. Take your tapestry needle and sew the two ears on top of the head. Make sure the ears are facing towards the front of the head, where the eyes are! When you’re done, take your embroidery needle and black thread. Embroider a bunny’s nose in the middle of the face, a little below the eyes. Use the step-by-step embroidery drawing and the picture below as a reference. Switch colors to blue yarn. Don’t fo the second leg! Take both your legs. 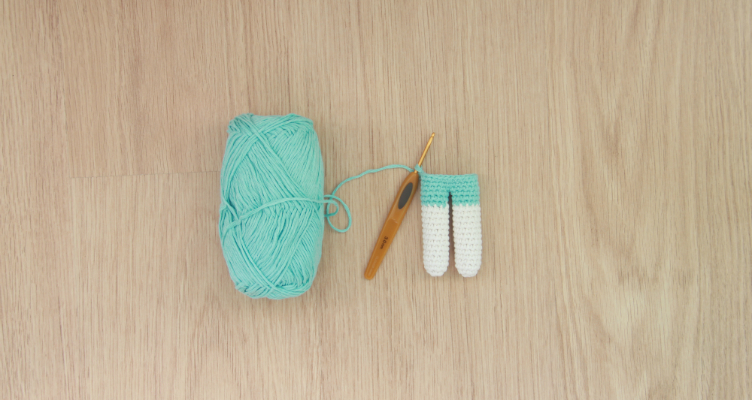 You will continue crocheting around, starting from your endpoint at the second leg, but instead of crocheting another round on your second leg, continue crocheting around your first leg. Once you’ve done all 12 sc, continue once again on your second leg and make 24 sc around there. This way you will mend the two legs together and make one new large round of 28 sc. This will count as round 1 of the body. Switch colors to white yarn. Start stuffing the legs and stuff the body as you crochet along. Fo and leave a long thread for sewing. Row 14: fold the top flat and sew the two sides together with 2 sc. Now sew all the parts together. First sew the body and head together by using the thread of the body and your tapestry needle. Next sew the two arms to the sides of the body. Lastly, sew the tiny tail on the bunny’s back, in the middle of the lower half of the torso. 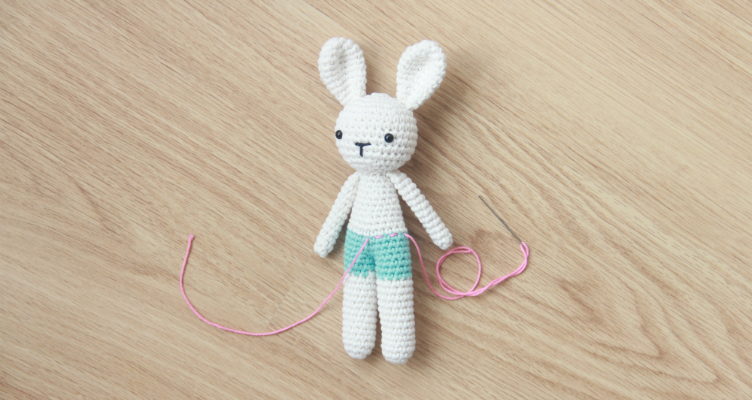 The last thing to do is to embroider the bunny’s belt. Take your pink thread and your embroidery needle. You enter the pants from the front, between the center crochet stitches. Now embroider around the top line of the pants. 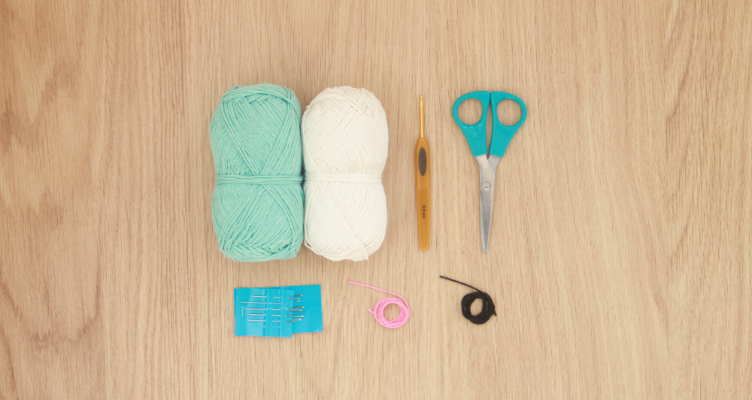 You will go over 1 crochet stitch, then under the next crochet stitch. Repeat this all around until you are at the front again. Exit through the entry hole. Tie a bow with the remainder of your thread. You’re done! I hope you enjoyed working through this pattern. I wish you a lovely week. J.A. Poolvos from Little Bear Crochets has been crocheting for many years, and designing amigurumi since 2015. You can find their patterns at www.littlebearcrochets.com and follow daily updates on their Instagram here.